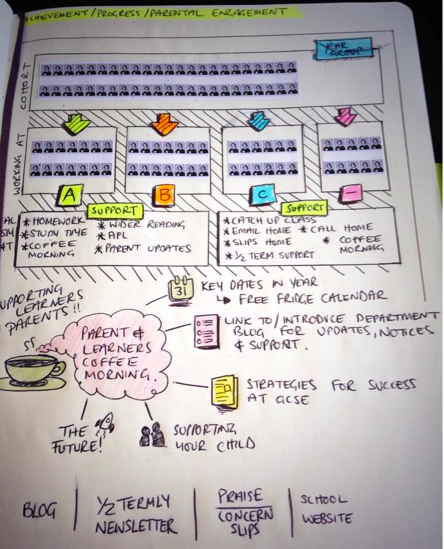 As a busy (amazingly so) Head of Department I want a way to track every single pupil in my departments care. I want to know what ‘group’ they are in (FSM, EAL etc), what their predicted, targeted and expected grades are…. AND I want to be able to see them and have those X factor ‘will they make the band’ style discussions about them with my dedicated team. So, for me one way to do this is to make it visual. Before the summer I bought a new book into which I have recorded all my ideas and plans for the department this year, and this is one of the ones I’m most excited to get moving with. On the right you can see the original design in my book for the system. This has to be visual, and something the team can review daily as well as in more detail in a department meeting, so to that end it has to be BIG and in our case the plan is to take up a whole office wall with it! One wall will be dedicated to the tracking of our pupils achievement! This goes into effect this week in my department, and the results of which will be posted here, along with photos of how it has been achived and a support sheet covering the theory behind the practice as well as the structured way the visual track will be used. Tune it through the week for the updates. Did this work? Do you have any photos of the magic wall?